Should you have an audiobook version of your book? How do you do an audiobook? And, most importantly, how do you make money with an audiobook? This guide to audiobook creation and marketing will also help you decide whether to voice your own book or hire a great narrator. The Author's Guide to Audiobook Creation includes the critical details of audiobook self-publishing on Amazon's Audible, iTunes, and beyond. Over $2 billion dollars in audiobooks were sold in 2015. This is how you join the audiobook revolution! Absolute Must-Read for All Authors and Narrators. As a big fan of audiobooks, I thought it would be interesting to learn more about how they are made, how authors turn their books into audiobooks, how narrators are found, etc. This short book turned my interest into fascination. I think every author (especially self-published authors) and narrator should read this. Unsurprisingly, the narration was top-notch as well. The book starts by giving you a brief history about how audiobooks came about, when the first ones were made, and how we got to the point we are today. Current and past trends involving audiobooks are examined with an emphasis on predictions for the future of this expanding form of book consumption. The book goes on to give a step-by-step guide of how to turn your book into an audiobook. It even discusses how to work with a publisher if you have already published the book. I actually found myself taking notes for things I wanted to look in to, including other ways to listen to and find audiobooks. To say this book was worth my time would be a significant understatement. I actually listened to the full book twice! What did you love best about The Author's Guide to Audiobook Creation? This is a comprehensive guide to all aspects of audiobook production. It is the quintessential author's companion to navigating the world of audiobook creation and promotion. Richard Rieman is a great storyteller, both as author and narrator. I enjoyed the book tremendously and found it to be a invaluable font of information. I assume that I'm not alone here, but I suffer from the delusion that not only am I capable of becoming a published author but that I would actually do an amazing job narrating my work myself, thereby reaping a huge financial windfall associated with the current audiobook boom sweeping the globe. I mean, I feel like I could literally be swimming in hundreds of dollars. So, I was pretty interested in the topic. The advice contained in Rieman's Guide is practical, pragmatic, and applicable to anyone who shares this particular mania. Not all of it was strictly common sense. There were quite a few things I would never have thought of myself and would have had to muddle through on my own. Most of the content felt original, but it was sprinkled throughout with tidbits from other indie authors and narrators. As a narrator, Rieman wasn't bad, himself, but he wasn't my favorite either. He did a fine job with the material and wasn't a distraction. The only negative I'd have about the book/audiobook is the cover art. It's really, really bad IMHO. Especially, in light of how Rieman specifically counsels authors to ensure they have high-quality artwork so their works will sell. I would definitely recommend this book to anyone interested in the audiobook business either professionally or out of a general curiosity. If you're an author and want to publish an audio version, this is a must read. Rieman is a pro. This book is totally worth the price and the time it takes to listen to it. Any author new to audiobook production should absolutely own it. It will save you the time and effort of scouring thousands of online resources just to mine the tiny nuggets of information presented to you here in one glittering treasure chest. I have gone through the book once so far, but I plan to listen to it again and take notes. Simply excellent. Thank you to the author for taking the time to make this information available. it's incredibly valuable. For all of your audio book creation needs Richard Rieman provides what you need to know. Very informative and a great guide. He tells you how to create your own narration but strongly suggests hiring a professional to do the work. Others may not agree with his strong stance but you need to be very self motivated to go this route. Overall I would suggest this book to anyone wanting to bring their story from the page to the headphones. Have you ever wanted to know just how much work goes into making the audio book you're listening too? Are you an author that have been getting requests to turn your novel into an audio book or thinking about doing so to get more attention for your novel? Then look no further. 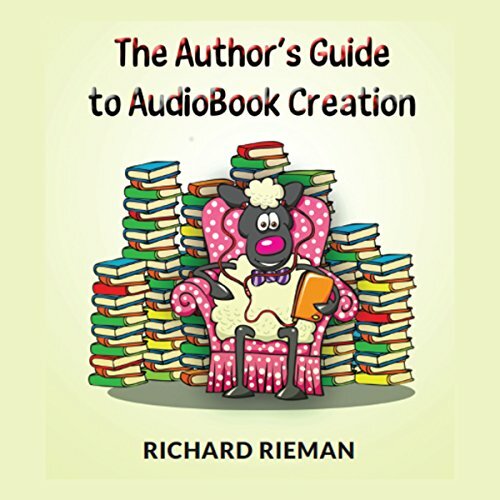 Richard Rieman's The Author's Guide to Audiobook Creation walks you through a typical process from start to finish of what you need to do as an author and just what is in store for you once you have started. Rieman's way of describing everything not only gets you interested in following along the path of what is required but he delivers the information in such an upbeat manor that you can't help but think he is truly enjoying reading his book. Even if you are not a published author or ever really considered putting your writings out there, Rieman gives advice and experience to what ever level you are at in the field of writing. I didn't know that so much useful information could be packed into such a short audio book. Really worth your time to give a listen. Even if you have no interest in writing or becoming a writer but you LOVE AUDIOBOOKS, I feel you really need to fully understand the journey of your listening enjoyment. I, for one, appreciate my audio books on a whole different level than I did before. Thank you Mr. Rieman for making me realize the complicated steps to making an audio book! Really enjoyed this audiobook. Narration was excellent and content was very thorough. I could have used this book two and a half years ago when I was stumbling through my first and only audiobook recording project. Super helpful tips from an insider who knows the ropes and won't coddle you. Get this book if the title grabs your attention. I enjoyed the fact that the book was not padded. He did a great job of just giving out relevant information and not repeating it endlessly just to fill the time. I have often found that some of shorter guidebooks are most useful because of this. This book fits that bill. It covers a great deal of material and is short enough that I can give it another listen or two to let the material sink in. Some of the advice on recording equipment and setup I think could apply to podcasts as well. What was one of the most memorable moments of The Author's Guide to Audiobook Creation? I especially appreciated the quote about changing sentence lengths to add interest. Have you listened to any of Richard Rieman’s other performances before? How does this one compare? I haven't heard any of his performances before, but he does a good job of having enthusiasm without it being over the top. His pace was solid as well. He didn't drone or go too fast. Good overall modulation. This book was given to me for free at my request in exchange for an unbiased review.